Madhyabindu Multiple Campus (MMC), established in 2063 B.S. (2006), became one of the leading community campuses, affiliated to Tribhuvan University (TU) and National Examinations Board (NEB). It is located at the center point of entire nation on East-West Highway. It was established to quench the thirst of local community people and students with a view to develop the country by providing qualified, skilled manpower with high moral ethics and has become the first choice of many students. within short span of time, the campus is able to receive Quality Assurance and Accreditation (QAA) certificate by University Grants Commission (UGC). The credit of the achievement goes all teaching and non-teaching personnel’s, academicians, guardians, stakeholders, students and local community people. The campus has been selected in 22nd position in Higher Education Reform Project (HERP) by University Grants Commission (UGC) of around 1200 community campuses in the nation. MMC runs classes in various streams and disciplines from Grade 11 to Master’s Degree in different shifts, from early dawn to dusk. To fulfill the education thirst of this locality students, Grade in 11, 12 science programs has been launched in this campus since 2070 B.S. (2013 AD). From the beginning, MMC is able to achieve outstanding results in Science Stream. Our laborious students Mr. Birendra Kafle (XI) and Mr. Sujan Pandey (XII) secured the first position in the district in NEB exam of 2072 B.S. Beside, our students have secured outstanding results in bachelor and master levels as well. The ultimate vision of MMC is to expand as a deemed University. 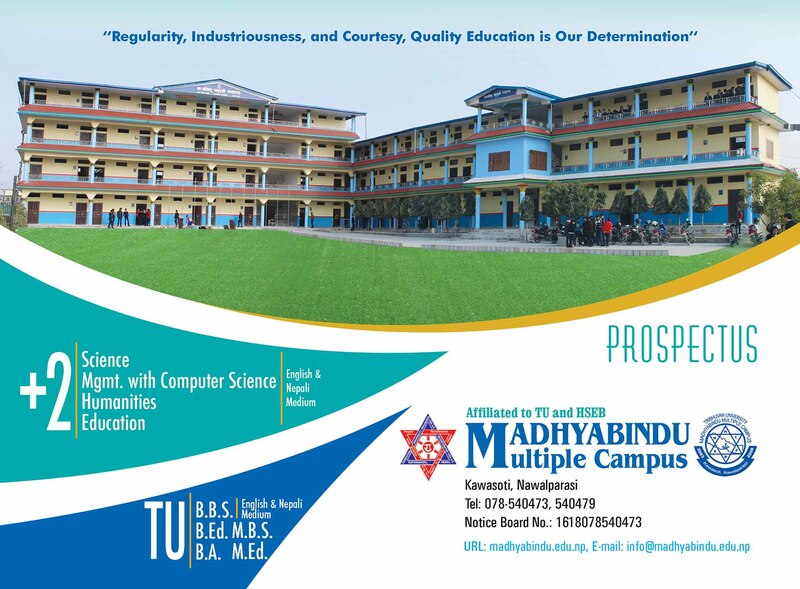 The mission of Madhyabindu Multiple Campus is to extend the facilities and easy excess of higher education of affordable cost and to establish the campus as one of the reputed academic centers of the nation as well as to produce quality manpower to fulfill the demand of the country and abroad. Create and expand opportunities for community participation of faculty, personnel and students. Increase access to quality education for deprived and minority groups in minimum fee. Produce outstanding, qualified and energetic graduates as per the necessity of market. Expand students understanding of the impact and values of individuals and their choices on society, intellectually and socially through group project and collaboration in learning communities.